Globally, low interest rates and the pressure to consolidate in many sectors of the economy made 2018 a great year in terms of value added for the corporate operations sector, which registered the third highest figure since 2001, at USD 3,530 million. Although this represents an 11.5% increase over 2017, the number of operations decreased for the first time since 2010, to 19,232, following nearly a decade of uninterrupted growth. The average size of each operation was USD 385 million, the second highest on record after 2015, which peaked at USD 400 million. Spain held firm its ninth place in the ranking of number of operations worldwide, with 3% of the total, similar to France and Canada. The ranking is led by the United States, with 21% of all operations, followed by China, with 16%, Germany with 7%, the UK with 6%, and Japan with 4%. Abundant liquidity in the system, the need to invest venture capital funds and the pressure on many companies to consolidate their respective sectors are the reasons why values have continued to increase in recent years. On the other hand, there are a number of risks to the global economy that could reduce investor appetite. If they were to materialise, we could see a significant decline in the coming years. Primary among these are: i) the trade wars started this year by the US and its partners, ii) political instability, with growing populism in countries such as the US, the UK (Brexit), Brazil, France and Spain; and iii) the possibility that the main central banks will raise interest rates faster than expected (Federal Reserve, European Central Bank, etc.). However, based on the forecasts for 2019 we are optimistic about the future. 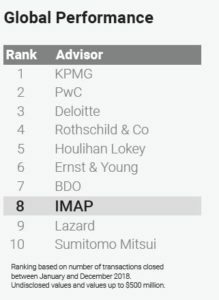 Once again in 2018, IMAP has maintained its position in the top 10 global ranking per number of corporate operations in the mid-market segment (up to USD 500 million in value). Our organisation completed 208 transactions in 2018 (vs. 204 in 2017), with an aggregate volume in excess of USD 10 billion and a price per operation, of the publicly reported ones, of USD 62 million. Venture capital funds were involved in about a quarter of these transactions. In terms of economic sectors, the technology and industrial sectors accounted for 40% of the total transaction value. One of the trends observed during the year was the purchase of technology companies and assets by non-technological companies, so it is not surprising that this sector, together with health care, reported the highest average multiple paid in its operations. Geographically, 29% of transactions were cross-border, with buyer and seller companies located in different countries. 40% of the operations involved a company acquired in Western Europe, while 30% of the time the company was located in North America. Business was also brisk in Scandinavia, Central and Eastern Europe. Not unexpectedly, activity was weak in Latin America due to political transitions and market uncertainty, although it is expected to bounce back this year. For the foreseeable future, IMAP is positioned to continue offering superior quality advice to its clients. IMAP President Jurgis Oniunas summed it up this way: “With a team of nearly 500 professionals in 60 offices and 39 countries, we continue to fulfil our mission of finding innovative solutions and profitable opportunities for our clients as the leading independent global M&A organisation. In 2018 we participated in multiple business planning and valuation and financial restructuring projects. We successfully closed seven corporate transactions, three of which were cross-border, where a foreign buyer (USA, Germany and Italy) acquired a domestic company. By sectors (apart from Real Estate), we are seeing vigorous activity in the automotive sector where companies, despite the uncertainties, continue to position themselves in technologies and markets through corporate operations. The food and beverage sector continues to be very active in corporate operations and the search for opportunities by both industry players and financial partners, who have reappeared on the scene with renewed strength. We are also seeing mature sectors such as the distribution and transformation of steel and metal actively looking for value-added alternatives as well as new business opportunities and markets. Information technology, the environment, power generation and related equipment, logistics and distribution are other areas with significant numbers of corporate operations. By type of operation, we see a balance between buying and selling, which is an indicator of confidence in the future and the need for companies to consolidate their positions. Another relevant aspect is the growing interest of companies/investors from other countries in Basque and Spanish companies, which increases the options for selling or adding strategic industrial partners. Where acquisitions are concerned, our clients are generally looking for opportunities in specific markets and technologies, mostly in other countries/continents. As a result, we are starting to see medium-sized companies with their own corporate strategies for international expansion. Prices are experiencing some inflation as a consequence of existing liquidity and the pressure from financial investors. Paradoxically, it is not unusual in acquisitions to see them making higher offers to the industrial partners with whom they compete. Given all of this, we believe it is a good time to look for sales opportunities or partners. The outlook for this year is very positive due to the interest among our clients to undertake corporate purchases and sales and the orders we received last year. The underlying reasons for this high level of activity are the consolidation processes observed in various sectors, the need for companies to guarantee their continuity in the absence of generational change and the attraction of resources to increase the size of the company or to undertake restructuring. The most recurrent sectors are technology, industry and food, where we see an upward trend in the coming years. In 2018 we also took steps to guarantee our ability to continue offering only the highest quality services. Ramón Fernández Olmedo joined the company as the Manager of the Madrid office and we also introduced a new alternative financing service to enable companies to access new and innovative funding sources.